Well we are almost finished on this project. Rather take a little longer that put out the junk that comes from… Anyway, plan was to make it cleaner than mine! I know right Had it out making noise today. Still missing some parts (Strut brace in custom texture black) and needs that blue plastic removed but you get the idea. More pics on the image link. My FlipVideo died so only old camera VIDEO. Thats the exhaust in race mode with the straight pipe on the back. 1min vband swap to quiet. More videos once we get some miles on the motor and turn it up mapping it on the dyno. This entry was posted on Monday, February 1st, 2010 at 7.24 pm and is filed under (Dark) Viggen. You can follow any responses to this entry through the RSS 2.0 feed. You can leave a response, or trackback from your own site. 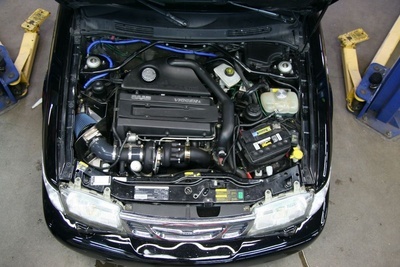 Whats the benefit of having the turbo mounted so high up? Just faster air access from the intake? This Vig looks awesome!! Sounds good too!! Overall packaging. Mainly eliminating the inlet compromises. Super easy to service too. The engine looks gorgeous. Can’t wait to see those videos of the viggen on the dyno! What do you expect it to pull? Hope for warm weather! Also, did you do a custom map for this or did you use something you had around before? Stage?